The Carolina Keeper eliminates the swivel and is designed for easy adjustment. Instructions: To place on line or when adjusting leader length always squeeze the Carolina Keeper with needle-nose pliers. When slit opens, thread line through hole opening and release pliers. 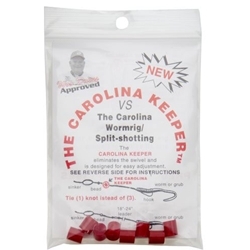 If slippage occurs two Carolina Keepers may be needed especially for heavier sinkers 1/2oz or more.